The flowers are especially treasured for their mild analgesic (pain-relieving) properties, making them an excellent addition to products designed for sore muscles or other external aches and pains. They’re also traditionally used in preparations to heal rough chapped skin. In this post, we’re going to cover 12 pretty and practical ways that you can use dandelion flowers to make things that are good and useful for you and your family. Note: Dandelions are generally safe for most people, but if you have active gallstones, are on diuretics, are pregnant, nursing or on medication, check with a health care provider before consuming internally. If you’re allergic to dandelions, don’t use these recipes. If you don’t have dandelion flowers where you live, you can occasionally find some for sale on Etsy. Dandelion salve is especially ideal for those who work outdoors and with their hands a lot! 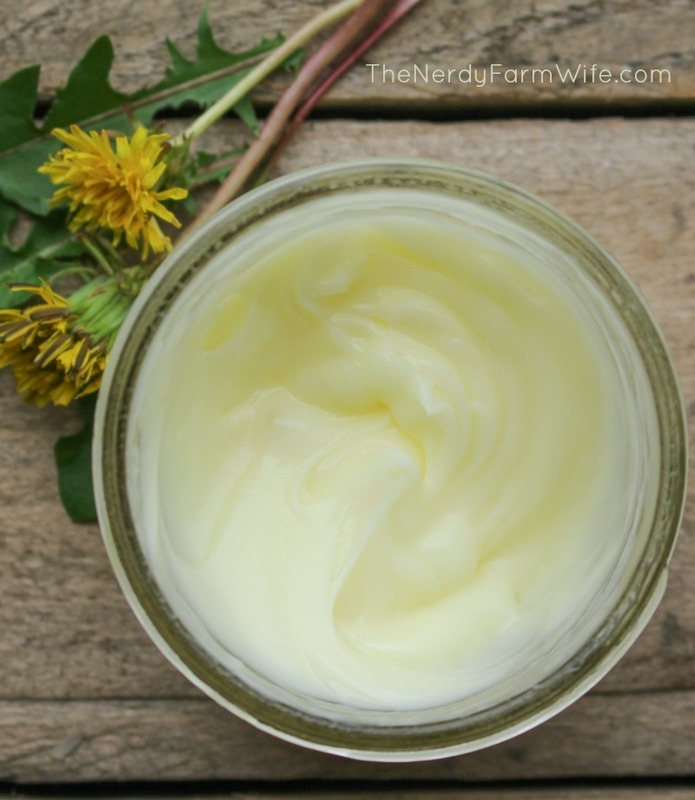 Find out (HERE) how to make and use dandelion salve. To make: Gather fresh dandelion blossoms and leaves, rinse them well, and fill a jar quite full of them, but don’t pack too tightly. Pour apple cider vinegar over the fresh plant matter until the jar is filled. Cover the top of the jar with wax paper or plastic wrap and then a lid. (This added layer keeps the acidity of the vinegar from eating away at metal lids.) Place the covered jar in a dark cabinet and store for 4 to 6 weeks, shaking occasionally. Strain and it’s ready to use! This delicious way to use dandelion flowers was sent to me by Tina, a lovely reader in Denmark! 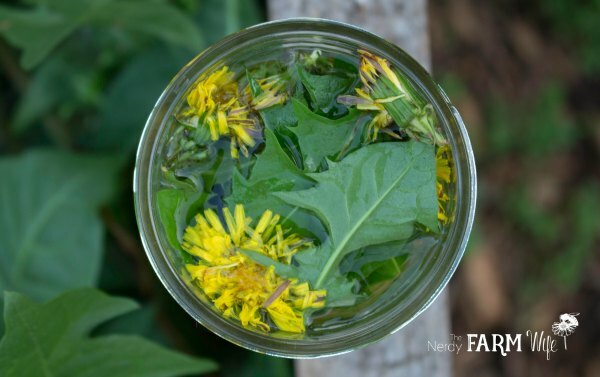 She was kind enough to translate and share a few traditional Scandinavian foraging recipes with me, including this one for Dandelion Syrup that she makes each summer. You can find her recipe for traditional Scandinavian dandelion syrup HERE. 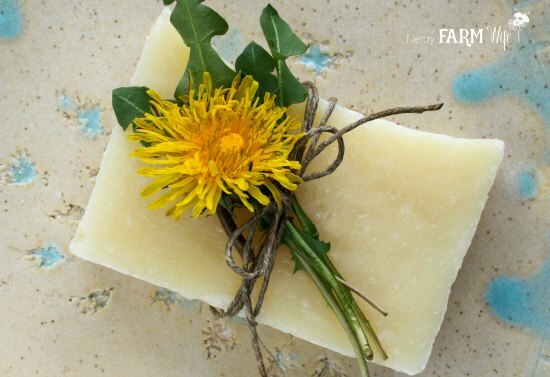 I made my first dandelion soap about 12 years ago, wondering what would happen if I put dandelion tea and dandelion oil in my favorite plain soap recipe. I was so happy with the results that I’ve made new variations almost every year since. Dandelion soap is a perennial favorite among friends and family, and one of my top sellers from when I sold my soaps. 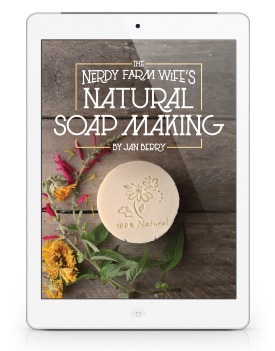 For more soap inspiration and recipes, check out my Natural Soap Making package! 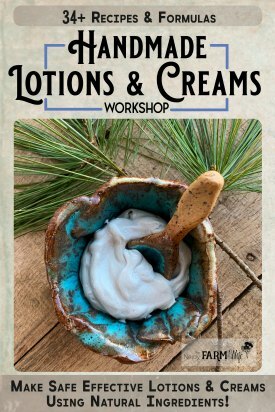 I originally made these lotion bars for my husband. As a rock mason, the mortar and rough stone left his hands dry, cracked, and bleeding. 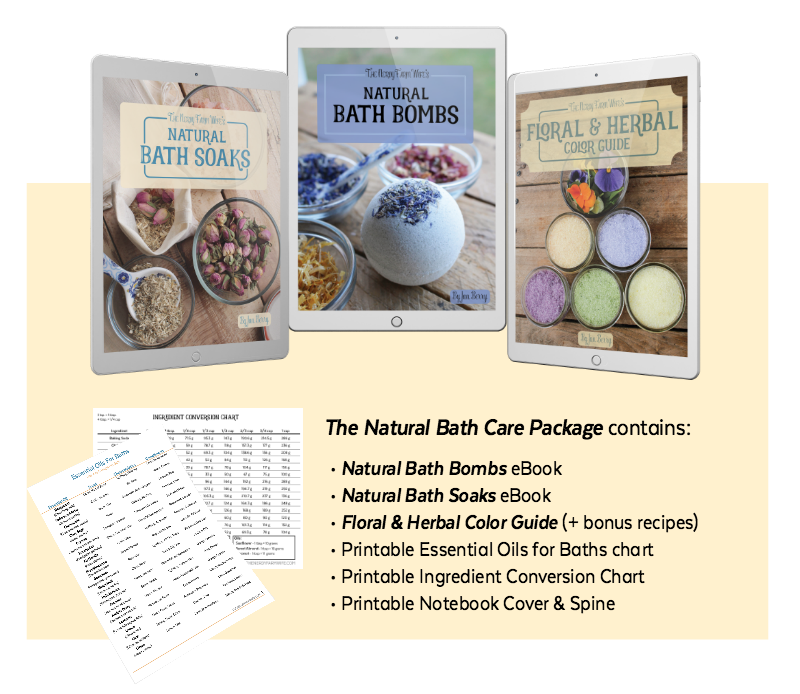 Lotion bars have a long history of helping the toughest cases of cracked dry skin, while dandelion oil is particularly useful for alleviating the chapped skin and soreness that comes along with manual labor. This combination is excellent for his skin. He rubs the bar over his hands several times while watching TV each evening. There’s no messy salve to deal with and he can use it on the spots that are most bothering him. 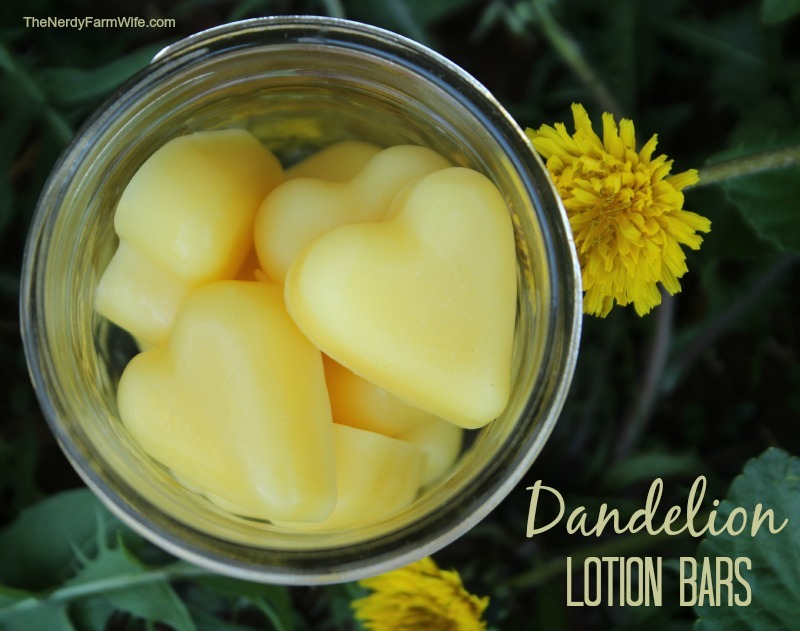 You can find the recipe and directions to make these sweet little dandelion lotion bars HERE. 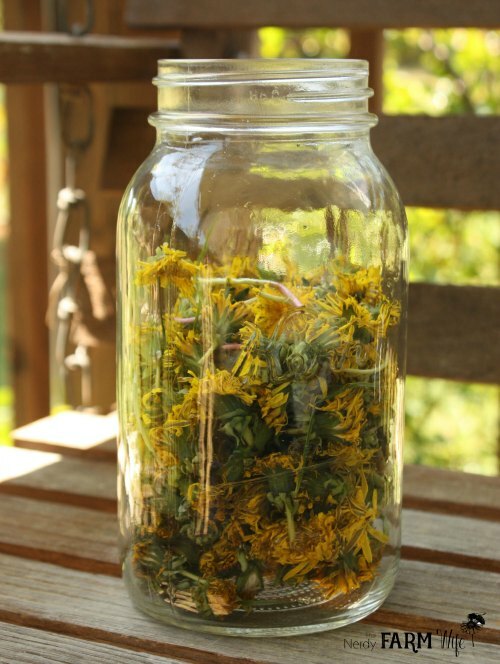 Dandelion tea can be made by packing fresh flowers and leaves into a mason jar and pouring simmering water over them. Let the tea infuse until it’s cool enough to drink then strain. 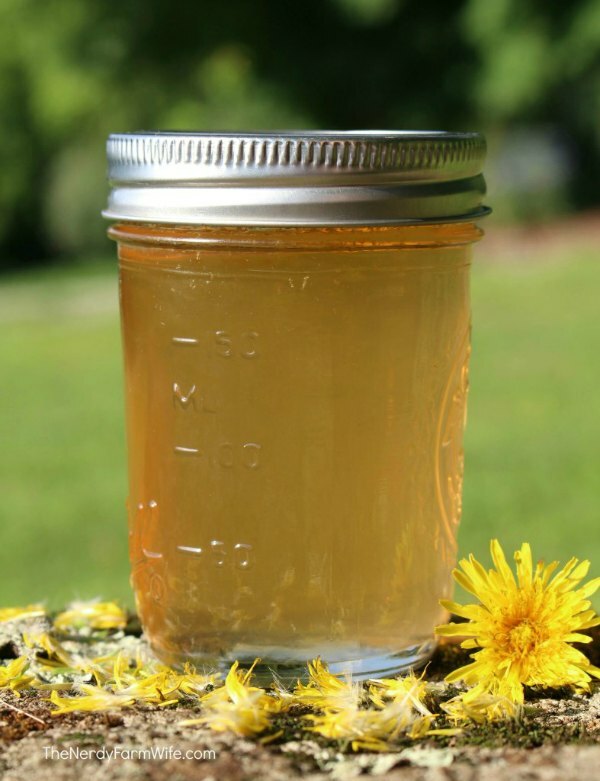 Dandelion tea is a classic spring herbal tonic. It helps purify and detox the blood and and is useful for helping the secondary symptoms of a sluggish system such as acne and constipation. While dandelion tea can be helpful for some digestive issues, use caution if you have ulcers or chronic health issues and consult a medical professional before using. Dosage for the tea is one to three cups per day, starting with a low amount and working your way up since it has laxative and diuretic properties your body may need to adjust to. I originally designed this recipe for my 101 Easy Homemade Products for Your Skin, Health & Home book. It was an instant hit with everyone who tested it, relieving leg cramps, back aches, growing pains, restless leg syndrome and various related ailments. One relative with chronic nerve pain in her arm declared it the best thing I’d ever created! Dandelion oil and magnesium oil are both wonderful ingredients on their own, but when combined, they have a special synergy that’s amazing! 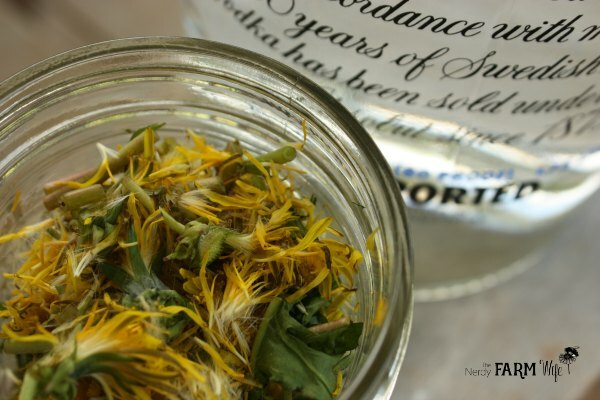 Tinctures are one of the best ways to preserve the benefits of dandelions. While this form does contain alcohol, it’s so concentrated that the end dose is similar to the alcohol content of some cough syrups. The dosage is counted in drops instead of cups. If you don’t consume alcohol, use dandelion vinegar (see #3) for similar properties. 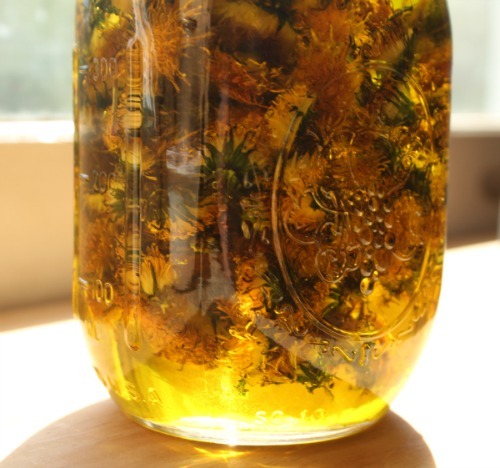 To make a tincture, dig up a dandelion plant – root, leaves, flower, stem… the whole thing! Rinse it well then chop it as finely as you can. Place the pieces in a mason jar (jar size depends on how much plant you’ve gathered up) then cover with an 80 proof or higher alcohol like vodka. It’s a good idea to keep a layer of plastic wrap or wax paper between the tincture and the lid, if it’s metallic. Cap and store in a cool dark place for 2 to 3 weeks before straining, making sure you shake the jar every so often. While traditional herbalists recommend a dosage of up to 30 to 40 drops, three or four times per day, I dose my family in much smaller amounts, never more than 4 or 5 drops at a time. (Tinctures are powerful things!) Use this tincture to help with constipation or a sluggish liver that leads to poor digestion and acne. The shelf life of this honey (strained) is at around a year (or longer), but if you don’t strain the flowers be sure to check for freshness each time before consuming. Take one to two tablespoons daily to possibly help with seasonal allergies and as a general health tonic. It’s also useful for sore throats, burns and as a face wash. Dandelion is safe for most people but is not recommended if you have active gallstones or are on a prescription diuretic. Also, the American Academy of Pediatrics does not recommend honey for children under the age of one. 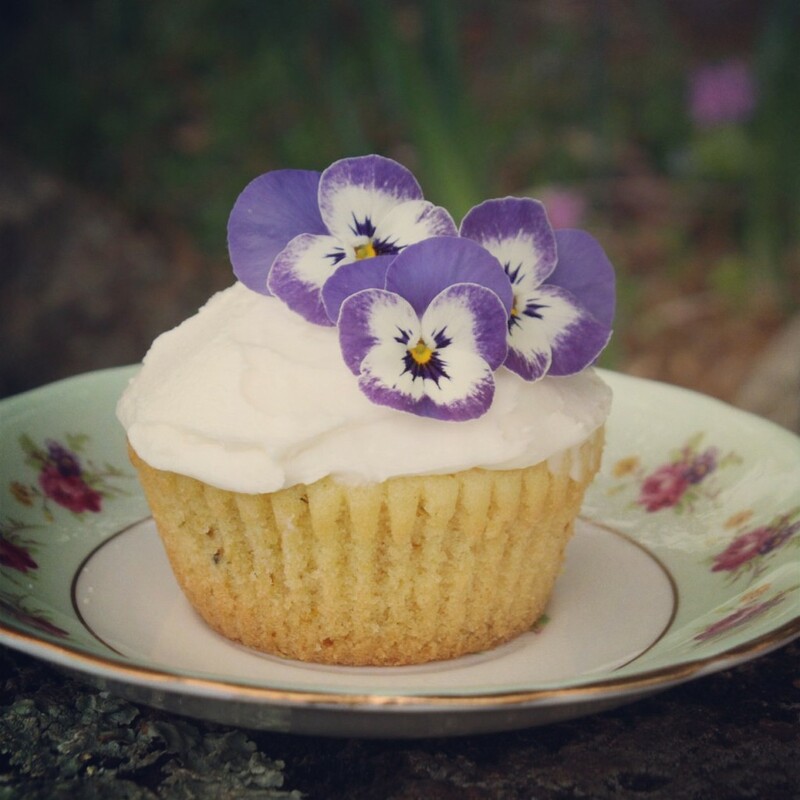 Mix up your favorite cupcake recipe, stir in the yellow petals, then bake like normal. Let cool, frost and add an edible flower or two on top for decoration. Some flower ideas for topping: pansies, violets, violas, dianthus, lilac, bachelor buttons, hollyhocks and roses. 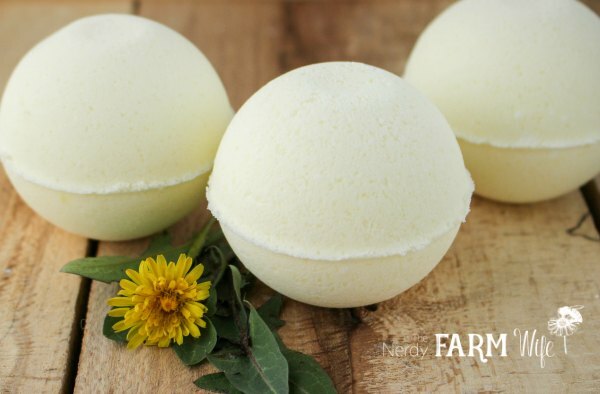 These all natural bath bombs capture the sunshiny happiness of a field full of spring dandelions. A few drops of sea buckthorn oil gives them a pretty yellow color, but you could also add a small amount of yellow Brazilian clay for a different shade of yellow. The cheerful scent comes from a blend of litsea and orange (or lemon) essential oils, but you could change out the essential oils (lavender is another good option) or leave them unscented if you’d like. Find the full recipe and how to make them HERE. Tagged dandelion, edible flowers, foraging. Bookmark the permalink. Love this article and as i suffer with Arthritis and very dry skin on my hands and fingers I will be having a go at the Dandelion Flower salve and also the soap. Thank you for sharing. Hi Adena! Happy to hear you enjoyed the article! 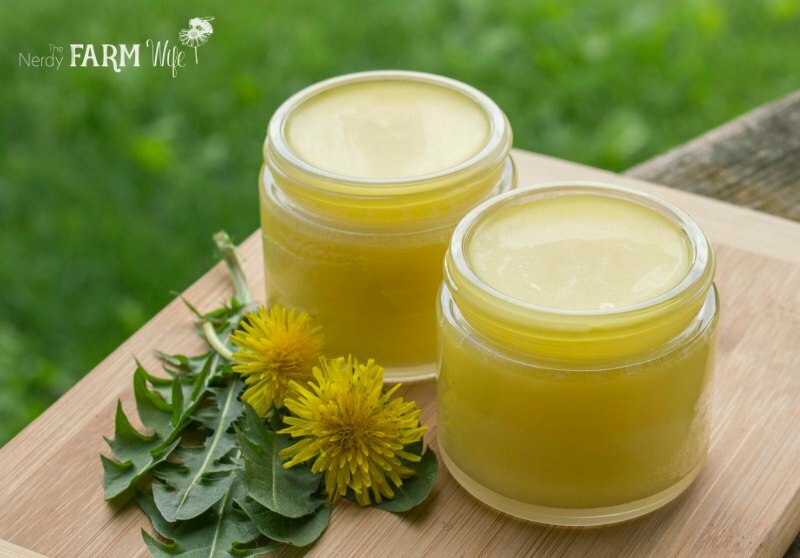 I hope that the dandelion salve helps your hands! Love all of your dandelion recipes! When I tell people that the dandelion is my favorite flower, they look at me and laugh, thinking I am joking. I am not! I especially want to try the lotion bars and the homemade dandelion soap. I make homemade soap, but have not tried dandelion soap. Hi Sue! I’m so glad that you like the recipes! Dandelions are among my top favorite flowers too. :) I hope you enjoy the dandelion lotion bars & soap! I have always loved dandelions. I like all the ideas how to use them. The medicinal purposes are wonderful. I would like to know how o make the dandelions under glass. I already make and LOVE magnesium lotion, so I’m definitely going to make some dandelion oil to mix with my lotion! Thanks for the great ideas!! 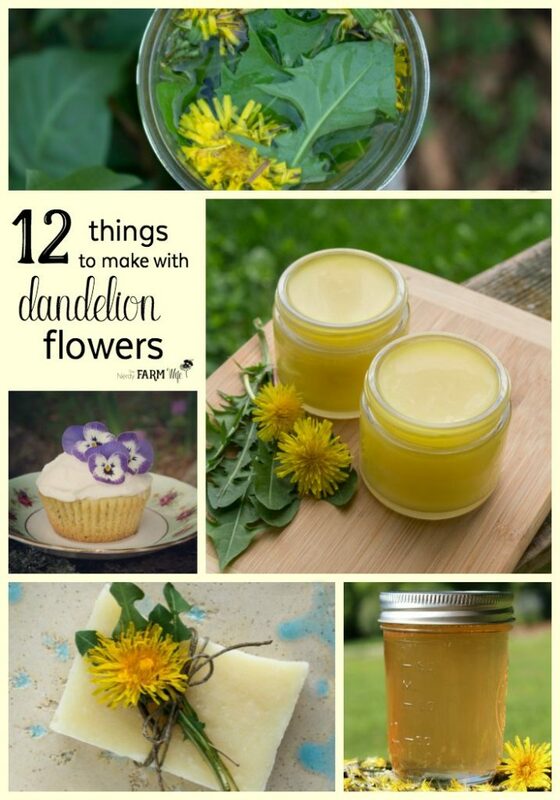 I am so thrilled and excited I found your blog on how to make dandelion flower salve. Great timing too since I have 4 acres of this beautiful flowers. I will head out today after work and start picking. Can’t wait to try this on my arthritic toe. I’m a runner (short distances) and will apply it to my feet after a run. Thank you so much for the recipe and keep your recipes coming. I love love what you do for us! Hi Ellen, How amazing to have 4 acres of dandelions! I’m happy to hear that you like the recipes & hope that you find the salve helps your toe! Hi Jan, I’ve been trying to make slow method infused dandelion olive oil with no success. It gets moldy in the jar ! Please help since I have access to dandelions only now and every time I try this happens. The flowers are not wet, but should I still dry them maybe first? Thank you! I really enjoyed reading this, especially the recipe for the salve for arthritis pain. Do you think I could add St. John’s Wort Oil to this formula to kick up the pain remedy feature? Really enjoyed this article. A novice herbalist, life long plant professional, your article is a joyful entry into my materia medica, providing many wonderful ideas for my solar infused almond / dandelion oil. Excellent, clear, attractive presentation. Thank you. Looking forward to exploring other herbal allies with you. Hi Trisha, Thanks for the kind words! I’m so happy you enjoyed the article! Does the dried dandelion leaf give the same effect or does it need to be the flower? Hi Debra! 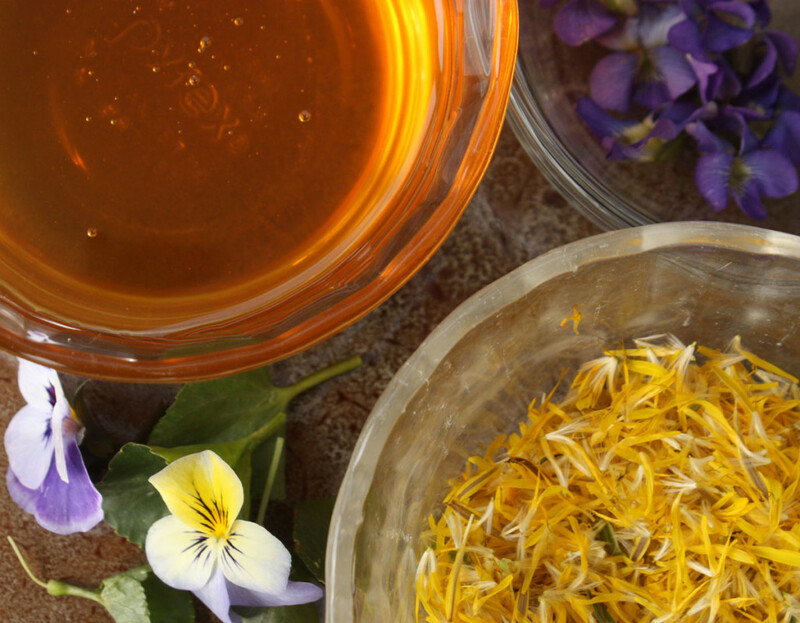 For topical salves & such, the flower is preferred, though I do mix some stems and leaves in every so often too.